After an early relationship with the YMCA as a boy, Ed Myers has gone on to teach people to swim for over sixty years – with a smile on his face and a joke on his lips each day, a love for swimming isn’t all “Mr. Ed” gives back to the TownLake YMCA. Our June 2014 RecognizeGood Legend award winner has been making waves for over 60 years! Ed Myers – known affectionately as “Mr. Ed” by some – will turn 84 years old this November, and has spent the majority of those years giving back to his community by teaching in the water. But if you ask those who know him best, it’s immediately evident that swimming lessons aren’t all he gives. “Swimming is just the connection,” says TownLake YMCA Pool Manager Jay Remson. “Mr. Ed brings people joy. There’s never a day when he doesn’t come in with a smile on his face, joy in his heart, and a joke ready to tell. Rain, snow or shine he is always there, bringing people joy.” Since the 1950s, Ed’s community impact has included establishing a swim program at his university, instructing swim and water safety lessons in the United States Navy, and now serving at Austin’s TownLake Y where he’s been called the “hidden jewel of the Austin YMCA.” Jay tells of students young and old who arrived with a deep psychological fear of the water, often due to traumatic or near-drowning experiences, only to be seen weeks later swimming laps after lessons with Mr. Ed. “People have gone out of their way to tell me to either hang onto him or to clone him,” laughs Jay. 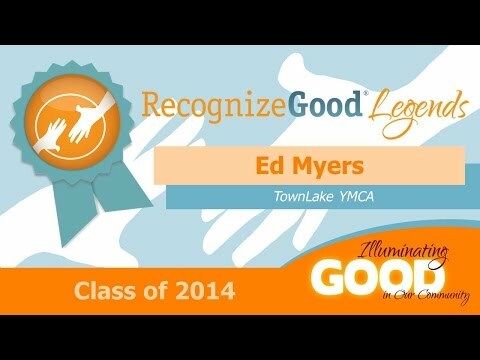 Ed has certainly given quite a lot back to the Y, and it’s no surprise that he chose the TownLake YMCA to receive his $1,000 pay-it-forward donation from RecognizeGood. After 60 years of bringing joy to those around him, we hope Ed Myers is just getting started!